Blurb: “The domestic goddess is back and this time it’s instant”, “Once you’ve seen what Nigella can do for you in 20 minutes, you’ll never want anything else”. Cooked from it before? Yes, fewer than 5 times. 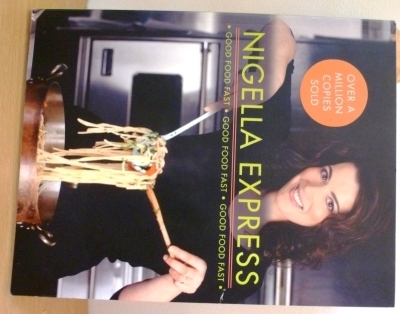 This is Nigella’s first appearance here, I have several of her books so I’ll try and space them out a little. As you’d expect from the Domestic Goddess the book is a stylish affair with luscious photography, and Lawson’s trademark style of writing, which I personally really enjoy. Recipes are grouped into themes such as “retro rapido” for classic dishes and “on the run” for packed lunches. The majority of recipes don’t have long lists of ingredients which are easily available but for some reason this book just hasn’t grabbed me. This may be because although the ingredients are easily available they aren’t the sort of thing I have in the house, and don’t see the point of going out to buy them for a supposedly quick dinner. 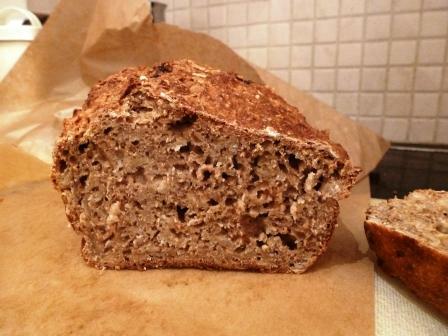 So, finding us low on bread and the shops closed I thought I’d try the lazy loaf recipe, which as well as promising fabulous bread with minimal effort also uses ingredients we actually had, yeast, muesli, bread flour and milk. 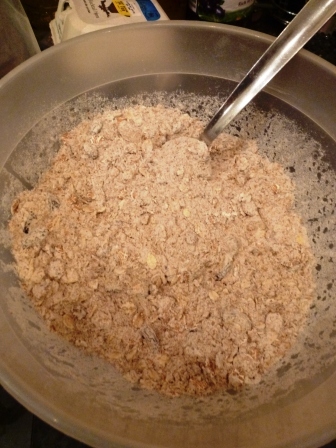 With no kneading, and no proving time the mixing stage is very simple; everything in a bowl and stir. The recipe does say the loaf will be dense and it is, but in a similar way to a non yeasted bread. Also despite containing yeast it doesn’t rise much. The loaf goes into a cold oven which I may be to give it a little time to rise but don’t expect a loaf with lots of oomph. The muesli gave added texture and the occasional nugget of dried fruit was a welcome addition. The loaf was really tasty, it lasted well and toasted nicely, we mainly ate it for breakfast but I think it would have gone well with cheese too making it a good all rounder too. Cook it again? Yes but I’m still not sure anything else has caught my eye. Cooked from it before? Yes but fewer than 5 times. I think this is a gorgeous book, very stylishly presented with beautiful photography but full of detail and quality recipes. 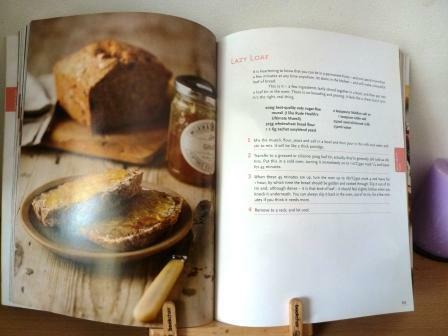 Each recipe is prefaced with some background, tips about key ingredients or an anecdote giving the book a more conversational style and means you learn something extra as well as how to cook the dish. 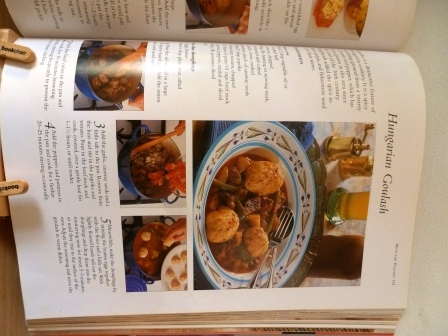 As you can see Caldesi’s recipe has a relatively small number of ingredients which are all easy to get hold of. It also includes chicken livers (the dark red mass to the right of the picture) and milk both more traditional ingredients in Bologna but which certainly weren’t in the versions of this my mum used to make! I wouldn’t say the book as a whole it is aimed at completely novice cooks, the recipes do assume some knowledge and confidence especially for more technical procedures like butterflying a leg of lamb but Katie Caldesi takes you through everything in clear steps. 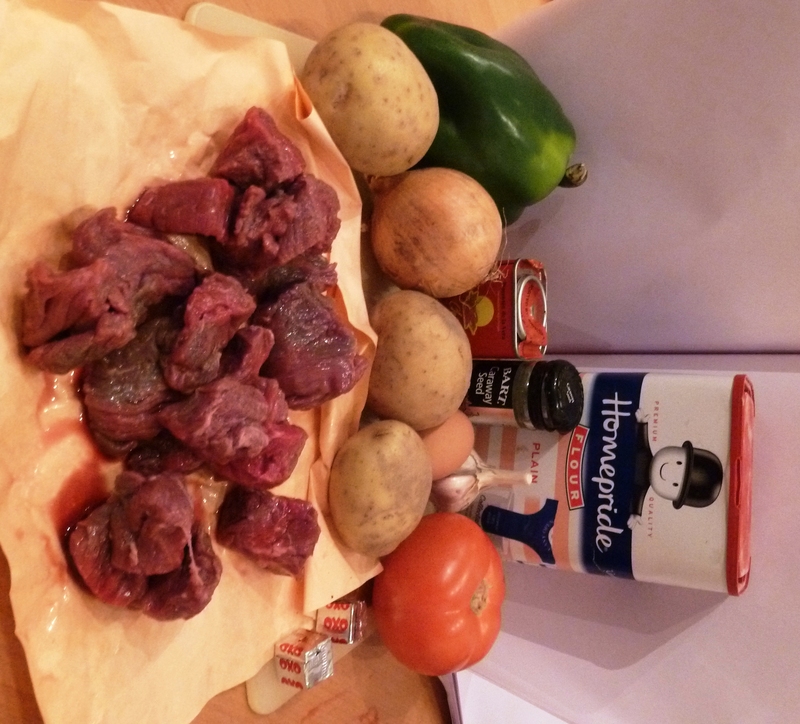 This recipe would be a great way into the book as it is straight forward, but delivers a depth of flavour (I think thanks to the chicken livers and milk) which sets it apart from other versions. For offal-phobes the liver is chopped very finely cooks down so you can’t taste it as an individual element but it gives an underlying richness and deeper flavour to the dish as does the milk. It does take a while to cook, around 2 hours, but it doesn’t need to be watched closely so you aren’t tied to the hob keeping an eye on it. 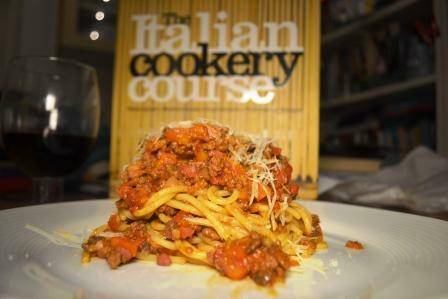 A lovely, rich ragu, impressive given the lack of herbs and garlic I would normally put in. The meat is really the star of this recipe which is relatively light on tomato which doesn’t dominate here as they can in other versions. Would I cook from it again? Yes and then some. 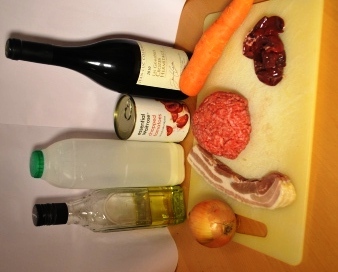 There’s a recipe for an Oxtail dish from Rome which I will be trying very soon. *Further book choices will be made in a similarly random manner. 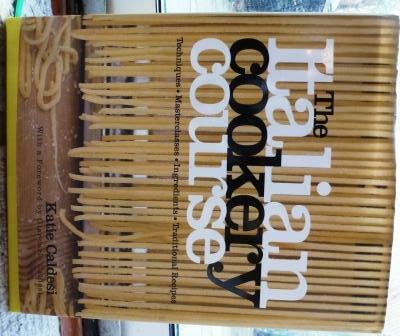 The Man and I have a lot of cookery books, I knew this. I just didn’t quite realise the scale of our collection. Every New Year I like to have a sort out and a tidy up, it helps me deal with the passing of the old year and helps me start the new one with the impression of being more organised. Today I counted the books on our cookery book shelves, yep specific cookery book shelves (I was chuffed to bits when I found our new flat had the perfect set of shelves so they could all be together in one place). Here they are … all 85 of them!!! I find them oddly comforting books and many have memories attached to them; we pick them up on holiday, people have give them as presents, some are impulse purchases, others longed for volumes. 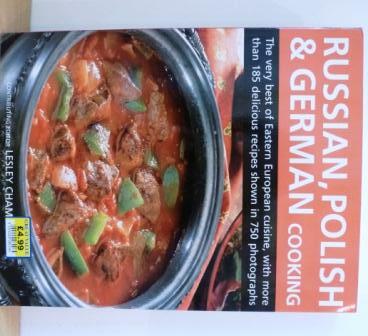 They range from the sublime, hello Fat Duck Cookbook to the ridiculous; I’m looking at you Favourite WV Campervan Recipes ! Shamefully some have been forgotten, never cooked from and the shelves are getting taken over with all kinds of other bits and pieces. If nothing else this is a waste of money and space, but I do think I would struggle to work out which to give away. 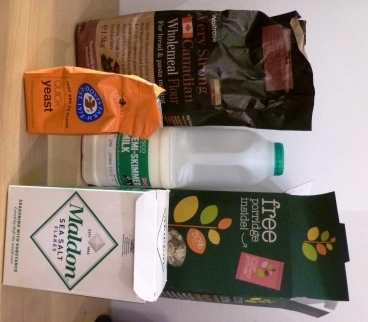 So … for the next 85 weeks I aim to cook at least one recipe from a different each week. Maybe by the end of this I’ll have worked out which books I can live without, (to make space for some more), but I hope it will also encourage me to try some new recipes and ingredients and add some more dishes to the list of ones we have regularly. I hope you’ll find it interesting and fun to follow. I’m sure it won’t be plain sailing and there are some interesting retro books in my collection which I’m going to have steel myself to cook from, but I did buy them! If anyone has any ideas about how I pick where to being I’d love to hear from you? Would you start alphabetically? By date published? What do you think? This recipe was an attempt to redeem myself after my collapsing bread disaster; with no kneading apparently required and a very slow overnight rise I thought I would give it a go. 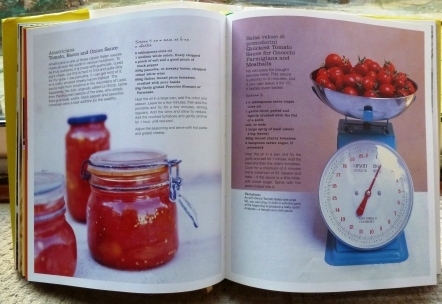 The idea came from my very cool copy of Ideas in Food but is based on one from the BBC Good Food website. I was a bit sceptical as to whether it would rise, be really heavy or taste like brioche. I have to say I was quite impressed, after peering at the dough nervously all evening as it didn’t seem to be “doing anything”, but the texture of the dough in the morning was much more elastic than I expected, and the buns did rise nicely. 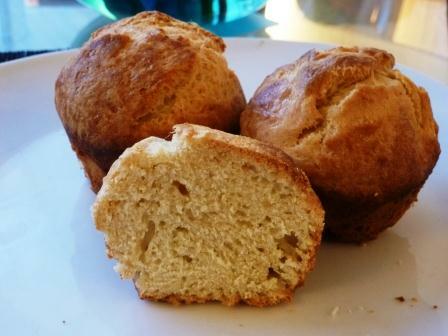 They aren’t the same as a more traditional brioche, but then I did half the recipe I’m posting as there are only two of us which made it a bit more fiddly (1 1/2 eggs is tricky to measure out, although you can keep the remainder to brush the tops with in the morning) but I would make it again as it was a lovely, super quick treat. Mix the butter, sugar and eggs in a large bowl – they’ll look a mess rather than coming together nicely. Add the flour, yeast and salt and pour on the milk. Stir the mixture to make a sticky dough (use you hands if you prefer), cover the bowl and leave somewhere cool for the whole day or overnight. Heat the oven to 190C/fan 170C/gas 5. Butter a 12-hole muffin or bun tin. Pull off lumps of dough the size of a clementine (flour your hands if it’s sticky) and form into a ball. Drop into one of the holes and repeat. Brush the tops with egg and bake for 20 minutes, or until golden and cooked through. I’ve been a bit flustered recently with one thing and another and in those circumstances I need to keep myself busy, so I’ve been baking up a storm. This doesn’t always mean baking well, the bread I made on friday to calm myself down with some kneading collapsed totally after I let it rise too quickly. However, I like to think I redeemed myself with these brownies. The recipe is adapted from Lorraine Pascale’s Baking Made Easy which won me second prize at the allotment association show in the summer, her victoria sponge won me a first so thanks Lorraine! Swapping the oreos for maltesers, some of which have been given a good whack with a rolling-pin (very therapeutic) gives the brownies a lovely malty taste as well as leaving nuggets of biscuits in the cooked mixture. They are very rich, but very good and won’t hang around for long! Preheat the oven to 180C/350F/Gas 4. Grease a 20cm/8in square baking tin with butter, then line with baking paper. Melt the butter in a pan over a medium heat. When the butter has melted, remove the pan from the heat and add the grated (or chopped) chocolate. Leave to stand for a few minutes, or until the chocolate melts, and then stir together. Alternatively, you can put the chocolate and butter in a bowl and melt in the microwave in 25-second blasts, stirring well each time. Whisk the eggs, egg yolks and vanilla together in a large bowl until the eggs begin to get light and fluffy. Add the sugar in two additions, whisking between each. Pour it around the side of the egg mix so as not to knock out the air that has been whisked in. Keep whisking until the mixture becomes stiffer. Once the egg mixture is ready, pour the chocolate into it – again around the sides so as not to knock the air out. Open one en of the bag of maltesers and hold it closed so they don’t go every where, place on a hard surface and give the bag a few good whacks with a rolling-pin to break up some of the chocolate. Add the flour, cocoa powder, salt and a the malteasers and stir until fully combined, then pour the mixture into the prepared tin. Bake on the middle shelf of the oven for 25–30 minutes. The middle should be very so slightly gooey. Leave the brownies to cool in the tin. 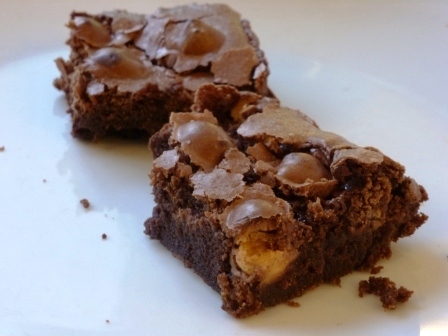 Pull the brownies out of the tin and cut into squares. Cochinita Pibil is a recipe I’ve been wanting to try at home for a long time after trying it at Wahaca and has been made possible by the haul of Mexican ingredients The Man and I brought back from New York. Some girls would have demanded a trip to Tiffany’s; I made sure we visited local stores and markets to pick up some hard to get items, luckily our luggage came in bang on the weight allowance flying home. 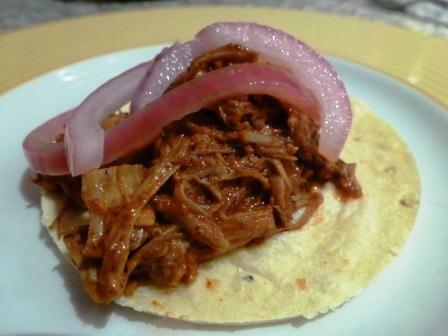 A traditional Mexican dish, Cochinita Pibil involves slow cooking pork, or sometimes a whole pig, in a deep red citrusy sauce until it is meltingly tender. The key ingredient here is Achiote (annato) powder which gives the dish its red colouring, and is also used in much smaller quantities to colour Red Leicester cheese. The recipe I used is a tweaked version of this one from Helen Graves. I love her blog, her recipes have never let me down and always deliver on taste. I had wanted to use a big slow cooking joint of meat that I could cook for a long time and would leave plenty of left overs, but in the end I plumped for four pork shoulder steaks and cooked them low and slow. The smell that filled the flat as it was cooking was insanely good and had The Man hanging round the kitchen looking longingly at the oven. The end result was awesome, wonderfully juicy and messy to eat piled on tacos and secured the highest level of praise from The Man “a triumph”! First off make the achiote paste although you can buy a ready-made version at Mex Grocer. It should look something like this, it is VERY RED but don’t be scared. I added this along with the meat to the achiote paste and left to marinate in the fridge to a few hours ,although it really deserves to be left for much longer; 24 hrs would be fantastic. When it’s time to get cooking, pre heat the oven to 150c. In a large pan with a lid brown the pork steaks, reserving the achiote paste. When the pork has a good level of char on each side add the left over paste to the pan along with a further 100ml of water and 100ml orange juice. Place the lid on the pan and place in the oven for 3 hours checking occasionally and toping up with orange juice if it looks like getting too dry. 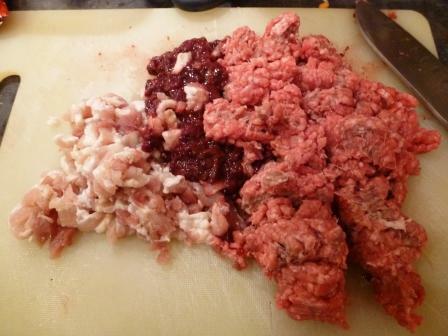 After 3 hours remove from the oven and shred the meat, it should be so soft it falls apart with pressure from a fork. We ate them with red onions “pickled” in lime juice and spicy salsa but I wish I’d made guacamole too. Do you still have a house guest left over hanging around after Christmas? No…check your cake tins, I once found a remnant of forgotten Christmas cake lurking in a tin in March! It probably had so much booze in it that it would have been edible but I just couldn’t face it. That story probably means I’m a very slovenly house keeper, but since I make my own Christmas cake I’m more keen than every to use it up and not let it go to waste. 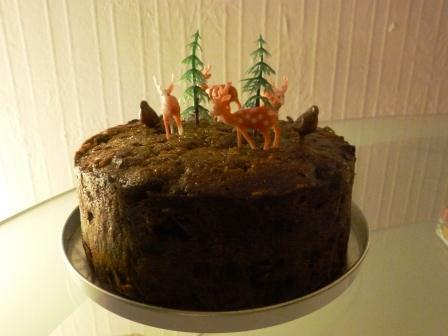 If you have thrown out any left over Christmas cake shame on you because you are missing a real treat. 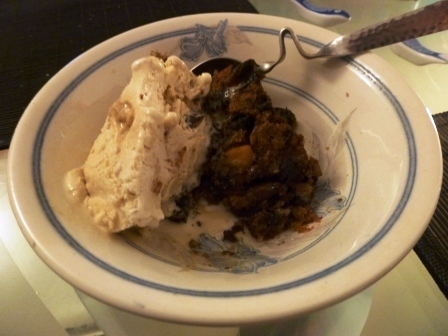 Warm Christmas cake with Christmas pudding ice cream. Oh yes dear reader, it may be January, chocolate rabbits and eggs may have appeared in the shops already and this may not even be a recipe but you will thank me for it! For the Christmas Pud ice cream I used a tub of butter scotch ice cream but vanilla would be fine; allowed it to soften and then stirred through the crumbled remains of a Christmas pudding. Re freeze, and you’re done. Don’t worry if you haven’t got any left, serve this with any ice cream you like. Cut a portion of Christmas cake, place in a bowl and warm it (I use the microwave for speed). Serve with a dollop of ice cream. I find this a particular pleasure with a drop of whisky, when all the decorations have come down, Christmas and New Year seem a long time ago, the Weight Watchers ads are on TV and things feel a bit grim. Perfect pick me up I’d say! Thrifty too if you’re feeling the pinch after the festive season. The Man and I have a major cook book habit; whilst this means we are never short of inspiration, it does mean we tend to forget books we have had for a while. Whilst this means that yes there are a number of infrequently used books taking up a lot of shelf space, it also means that you get the joy of rediscovering a cracking book you had sort of forgotten about, in this case Jamie’s America. I loved this book when I we first got it, but haven’t cooked from it a great deal as I’m easily distracted by new cook books. However, after out trip to New York I decided to have another look and see what Jamie made of it. The book provides a number of Mr Oliver’s (i.e not necessarily totally authentic) takes on key New York dishes and I settled on his Fiery Dan Dan Noodles* as a feisty, New Year pick me up of a dish at the end of the dreaded first week back at work! 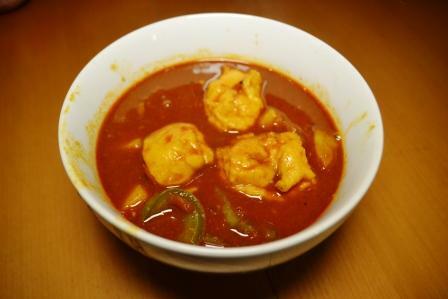 I was really pleased with the end result, a quick, tasty, spicy dish that I thinks will become part of the Hungry Sparrow repertoire. The only issue I had, and this may be due to me using a not very spicy chilli oil and Szechuan pepper that is loosing it’s spice but I didn’t find is as searingly hot as Jamie warns it might be, which was puzzling as I’m sure I halved the recipe quite carefully. The Man and I do like spicy food but I’m sure we haven’t burned our taste buds off too much. Dry fry the beef in a large pan until dark and crispy ( about 10-15 minutes), add the honey, stir for 30 seconds, then set aside. Place the noodles in the now boiling stock and cook as the packet direct, with a couple of minutes to go remove a cup full of the water and throw in the veg and cook until done to your liking. Drain the noodles and vegetables then return to the hot pan with cup of stock, garlic, soy sauce, Szechuan pepper, and chilli oil. 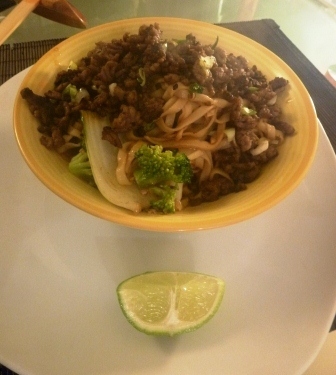 Divide this between two bowls and top with the crispy beef ( re heated if you like) and the chopped spring onions. Serve with a quarter of lime to squeeze over the top. Don’t bother trying to eat tidily, this isn’t a first date dish (or maybe it is depending on your outlook). * A quick Google suggests this version is very far removed from actual Szechuan Dan Dan Noodles, it is however a great recipe, if not one for pureists. I love Christmas and New Year but there comes a point when I know I should eat something other than mince pies and drink something other than gin and tonics! I look in the mirror and my skin looks awful and the extra pounds are all too obvious. I think it happens to a lot of people at this time of year, hence the popularity of detoxing. I would never advocate detoxing Ben Goldacre does a much more eloquent job of explaining why here but there is a point after Christmas when I need to return to a more sane way of eating, for the sake of my health and my wallet. This salad is from the River Cottage Veg Every Day book and is colorful, zesty, light enough to feel like it’s doing you some good but the avocado makes it a little more substantial. It’s very quick to prepare and the only fiddly bit is preparing the grapefruit. Slice the top and bottom from the grapefruit. Stand it upright on a board and work your way around the fruit with a sharp knife, cutting off the skin and all the pith. Now hold it in your hand over a bowl to catch the juice and slice carefully down between each segment to release from the membrane, letting the segments fall into the bowl, be careful with the knife while doing this! Squeeze the juice from the remaining membrane in too. Halve, and stone the avocado, cut lengthways into thin slices. 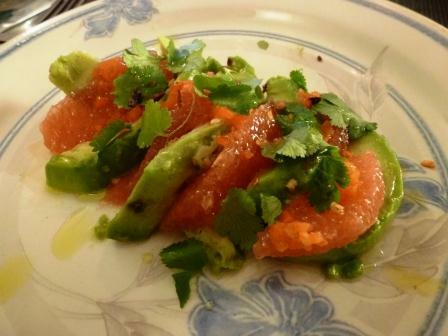 Arrange grapefruit segments and avocado on a plate and pour over the saved juice. Sprinkle a little salt and the chopped chilli over the salad. Finish with the coriander and a generous splash of olive oil. Serve straight away.